One of my favorite movies of the year is director James Ponsoldt (Smashed) and writers Scott Neustadter and Michael H. Weber’s (500 Days of Summer) coming of age drama The Spectacular Now. Led by fantastic lead performances from Miles Teller and Shailene Woodley, the film is about two High School seniors that are going in opposite directions. Sutter Keely (Teller) is the life of the party and loves to drink, while Aimee Finicky (Woodley) is pretty, but shy and removed from the popular crowd. When Sutter wakes up on Aimee’s lawn after being dumped by his girlfriend, what starts off as a rebound quickly turn into something more. The film also stars Brie Larson, Jennifer Jason Leigh, Mary Elizabeth Winstead, and Kyle Chandler. For more on the film, read Matt’s review. A few days ago at the Los Ageles press day, I spoke with Teller and Woodley. They talked about how the film feels real and not a Hollywood version of teenage life, the way everyone is praising the movie, what they collect, how they were both cast in Divergent, and more. Hit the jump to watch. 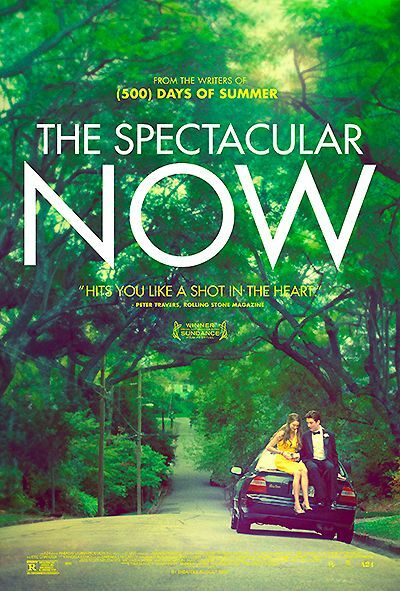 The Spectacular Now opens in limited release this weekend. For more with Woodley and Teller, you can watch the interview I did with them at Sundance here. How everyone is praising the film.